Today is special for a few reasons - it is the last day of AusNZVeganMoFo (which has single-handedly reignited my passion for blogging), it is one year and ten days since I first started this blog (and was convinced that no one ever would read it, so a huge thank you to those that do and who comment as well!) and it is my 100th post! No amazing new photos or revelations. If you can believe it my flickr pro account has expired today and though I have just renewed it, it takes a while before you can access it - so no new photo uploads for me! 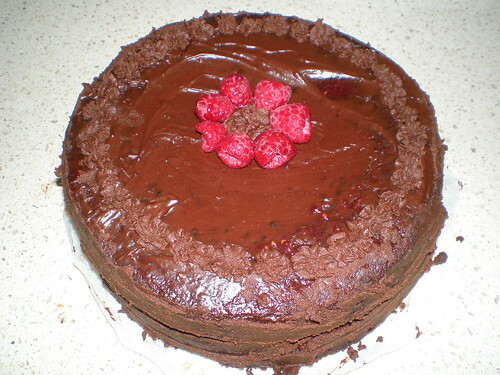 Raspberry Blackout Cake with Ganache Frosting from that wonderful book, Vegan With A Vengeance! Just a quick post today, as I am on call at the clinic after a long day! Tomorrow is another great day - the start of worldwide VeganMoFo! Tomorrow when I have some time, I am hoping to get a chance to share my story of veganism with you. It is not something I have really spoken about before! So I hope to share with some of you soon! My cousin had her baby shower today, and by some miracle I was not on call this weekend. Hurrah! I offered to do some vegan baking to bring along. 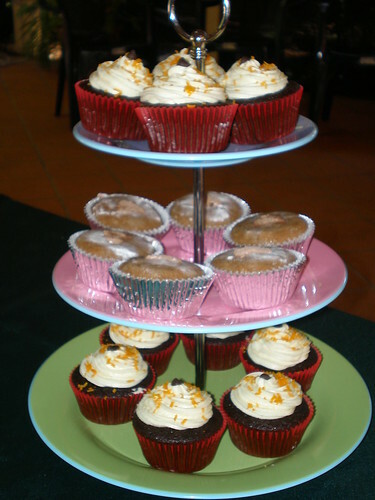 There are few things as handy, cute and impressive to take along to a party than cupcakes. So I opened up my copy of Vegan Cupcakes Take Over The World when I got home from work on Saturday afternoon and set to work in the kitchen! 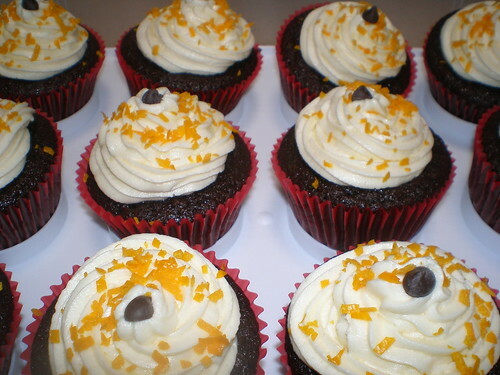 These are Chocolate Orange Cupcakes, a variation on the Basic Chocolate Cupcake. These are so amazingly AWESOME! In the batter I used the option of adding one and a half teaspoons of orange essence and I also substituted 1/8 cup of sugar with Cointreau. The batter is so great you could practically drink it! 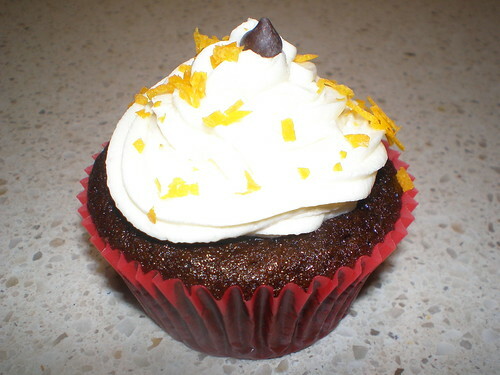 It is topped with Orange Buttercream and decorated with chopped orange zest and a chocolate chip. I think they looked adorable. They are fantastic, the cupcake itself is so light and moist and the whole ensemble is just delicious. 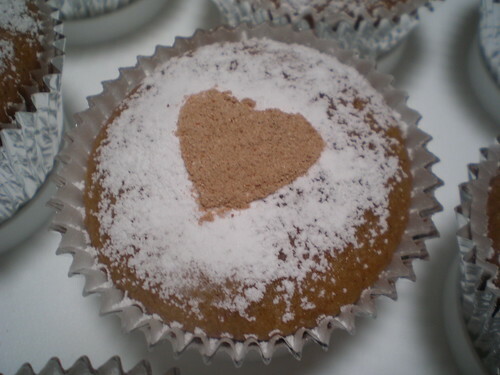 Chai Latte Cupcakes were the second cupcake on the menu. I had made these once before, but this time I decided to try and stencil a design on it. The topping mixture (icing sugar, cocoa and cinnamon) make far more than you need, so I had some saved from my first time of making it (and some saved for more batches later). 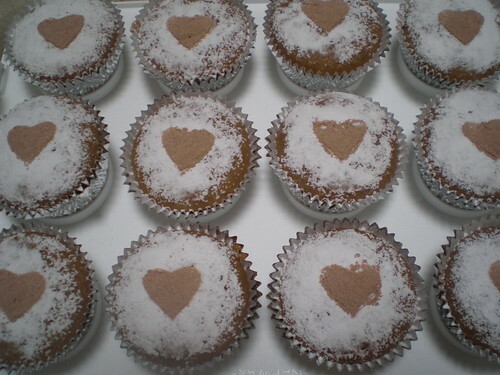 First I dusted on a layer or two of plain icing sugar, then the stencil. The heart stencil looks cute, but next time I would make the heart larger andmore defined - some of them look like triangles! Sadly, by the time the cupcakes were transported and hung around waiting for the sweets to be served the the sugar had kind of melted into the cupcakes like a glaze. You could still see the heart, but not as cute as when I first did them. If you can, try and wait until the last minute before serving before putting on the stencil! Here they are all ready to be served on my cute little tiered server. They were well received, and people could not believe they were made with no animal ingredients! It is always good to show some people exactly what vegan cooking is all about! 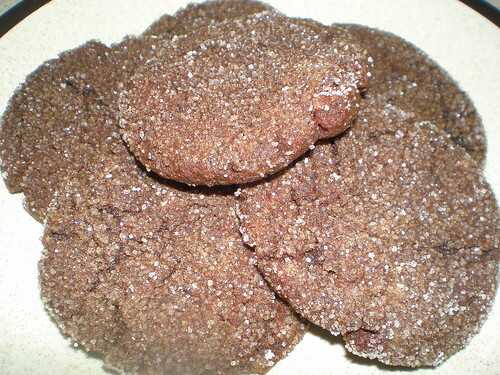 For some extra fun, I made Mexican Hot Chocolate Snickerdoodles from Isa and Terry's upcoming book Vegan Cookies Invade Your Cookie Jar. They are delicious, with a fantastic chilli kick! Very delicious. 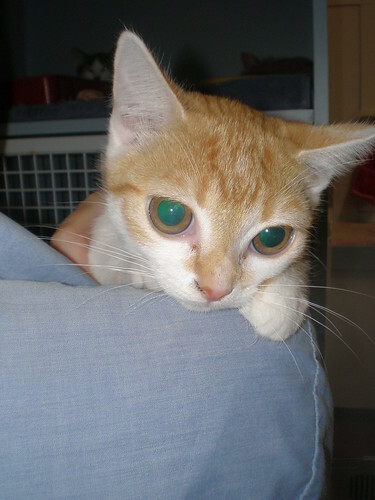 Meet Nora, also known as 'bug' because of her curious little bug-eyed appearance! 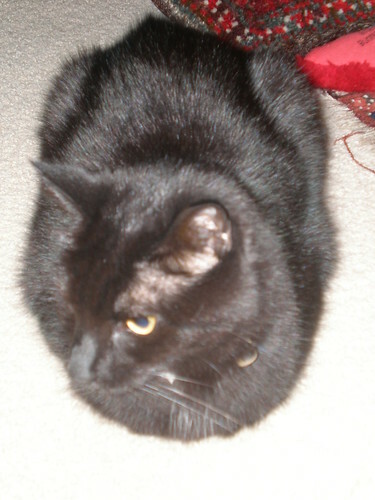 You can't see it quite as clearly with the angle she has her face (typical kitty, looked everywhere but the camera! ), but it is quite an adorable little appearance. Nora is one of a litter of six kittens we have at the clinic, we shall soon be looking for homes for them! Then you too can have pretty looking dinners! I made these two recipes for dinner one night because they seemed both a bit fun and cute. Both recipes come from Vegan Planet. The first course was Eggplant Salad Towers. A bed of green leaves topped with a giant crouton (read fancy word for a piece of toast, essentially... hee) and then layers of eggplant, tomato and a delicious marinated mixture of roasted red capsicum, peas, red onion, garlic, balsamic vinegar and lemon juice. Nom! It was delicious! I found that the nice bready crouton really anchored the flavour, but you could easily omit this to make it GF. 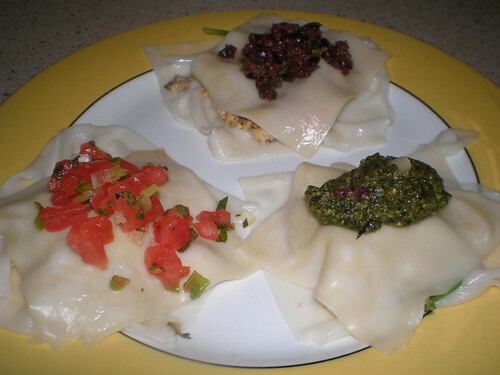 The second course was Ravioli Without Borders, which is an open ravioli using wonton wrappers. The recipe instructs you to boil the wrappers for three minutes, but when I did this they were way overcooked, stretchy, tearing and unmanageable! Maybe we have different wonton wrappers here? The ones I used were from the fridge section at the supermarket, and I found the best thing to do was grab them in tongs and just very briefly run them through a pot of boiling water. Also, be careful when buying wonton wrappers - most of them have eggs in them! The filling is made from crumbled tofu, shiitake mushrooms, garlic, onion and roasted capsicum and there is also a layer of baby spinach leaves inside. 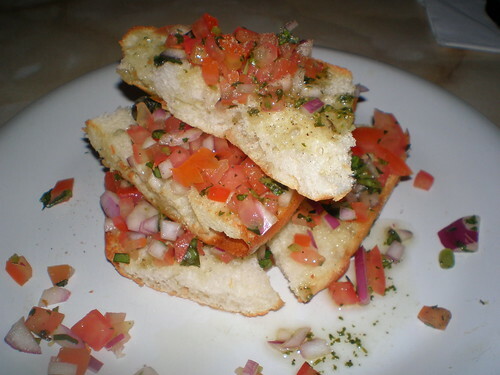 The toppings on them are salsa, tapenade and pesto (all made from recipes from the book). The verdict was delicious! And kind of pretty to boot! I thought I would feature Gizmo today, because she has been keeping me company this morning while her sisters have been enjoying some fresh air. Gizmo loves to sleep. My friend Jessie loves to sleep. 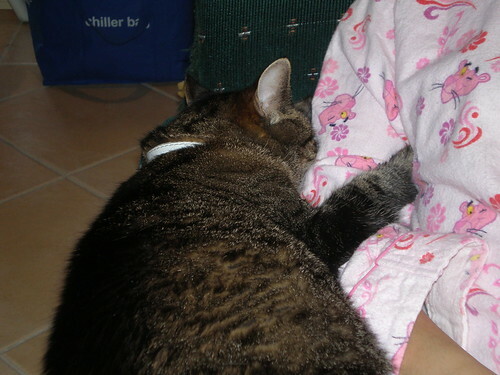 Here is Gizmo, sleeping with her arms wrapped around Jessie's arm. Is it love? Or a clever way to not fall off the edge of the sofa? Either way, it is a gorgeous snuggling snorgling snooze! Sleeping (along with eating and getting pats... and shedding fur) is something Gizmo excels at! I've had the last two days out of the blog world. 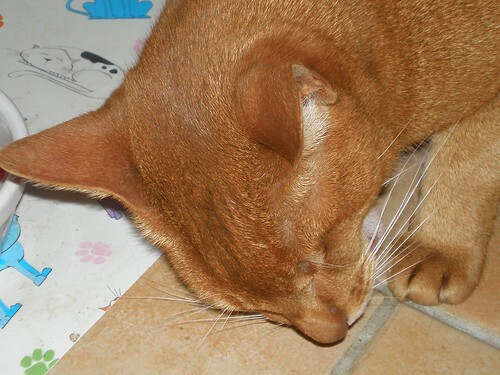 My holiday is over, my head cold is cleared (though the massive dust storm of yesterday has made me all snuffly again!) and I am back to work. I started work at 7am Tuesday and finished at 7pm on Wednesday, and was just a bit too tired to blog! I shall do me best to keep up with it now that I am back at the clinic. Also, I have signed up for VeganMoFo 2009, so October will bring another month of frequent posting! 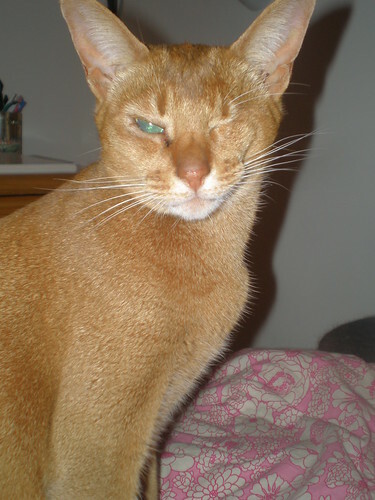 I take a break from AusNZVeganMoFo to post about my very not vegan but much beloved kitty Sahara. It was her birthday! OK, so it was on the 28th of August, but it took me a while to upload the photos. 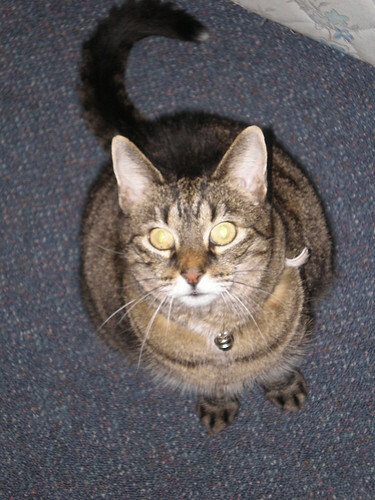 Sahara is my youngest kitty, and she is now EIGHT! This disturbs me a little, my babies should not be growing up that fast! Here are some photos of her on her special day! Munching her birthday dinner. Which is the same as her normal dinner because she has a sensitive tummy and has to have a fairly strict diet. 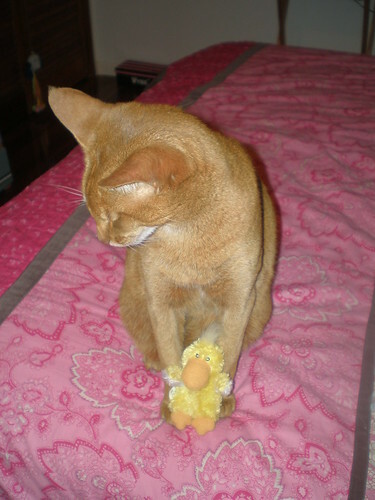 Here she is posing with her present - a little catnip stuffed duck friend! 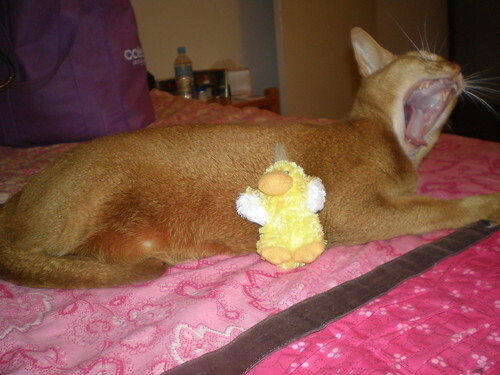 In fact, this little duck has Velcro at the back so you can refresh the catnip, which comes in a little tea bag like contraption for stuffing the duck with. Cool, yes? But what does Sahara think? Hmph! The duck has been largely ignored since it has been introduced! In fact, it is currently lying alone and sad on the bedroom floor. Oh well, it's the thought that counts. Right? But she's incredibly adorable, so you can't be upset with her. Look at that little face? Happy birthday my little red baby! Asian Noodle Salad with Spicy Peanut Sauce from Vegan Planet. This is fantastic! 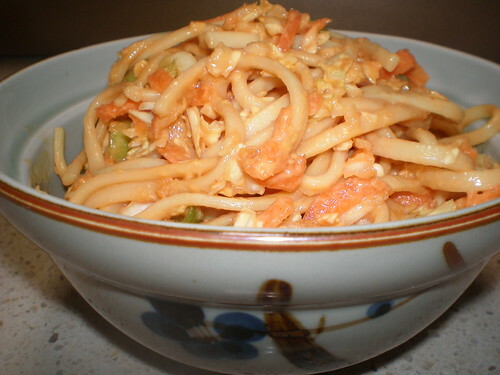 The noodles are udon noodles - using dried udon rather than the soft udon, SO much better. Chewy noodle goodness. The recipe says that you just want to coat the ingredients with the sauce, and only to add the sauce until this has been achieved. You don't want to drown it. I guessed the sauce recipe looked like a lot and made a half quantity, which was the perfect amount to just coat the salad. Fantastic on a hot day! 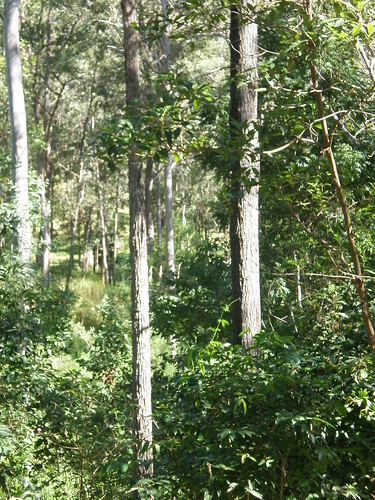 AusNZVeganMoFo: Getting away from it all - the second. Hello happy shiny vegans! I am currently on call at the clinic, on this fine Sunday evening, and am feeling far to bright and chirpy given that fact! 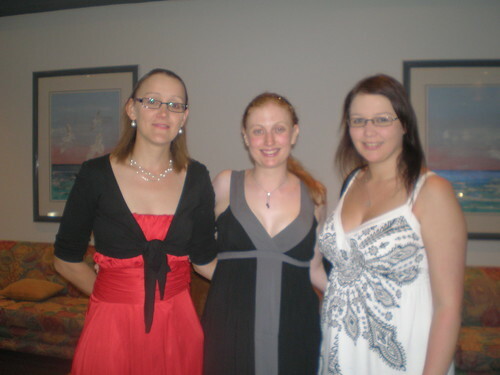 Anyway, if you cast your mind back I was at the Gold Coast with my Jens and we were about to go for dinner. The place was The Pink Poodle. OK, how could I NOT love a place with Pink in the name and some cute pink decor! 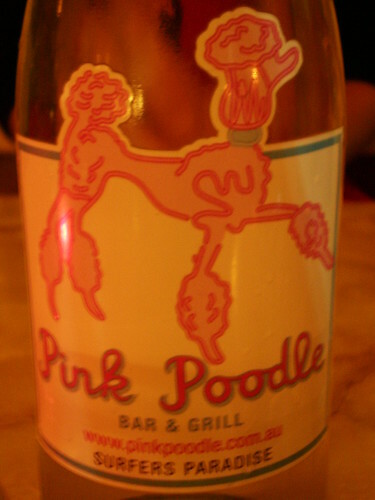 I continued my uncharacteristic (but very restrained) drinking with the namesake cocktail - The Pink Poodle. It involves Bacardi, Cointreau, strawberry and lemonade. It is so ridiculously amazing. It tastes like a really awesome creaming soda. If I was so inclined, I could have been drinking these all night! 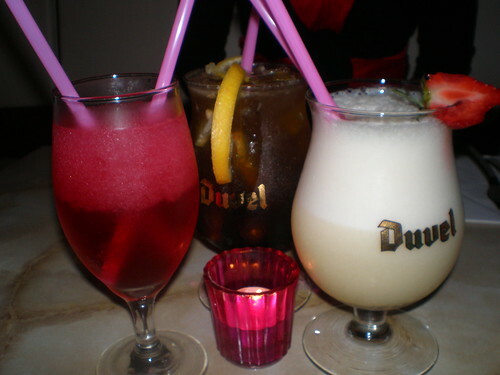 In the middle is Little Jen's Long Island Ice Tea. Meep! A little sip from that and I was reeling! And rounding it out is Big Jen's Pina Colada. I couldn't taste that one because they used cream, ick! Jen said it was good but the dairy cream made it too heavy and a bit much, and we all agreed that coconut cream would have been much better, and vegan friendly too! Hurrah! We shared an entree of Bruschetta of the menu, which I was assured was vegan. Fresh and tasty! Just the thing to start filling up the belly in the company of an awesome pink cocktail! 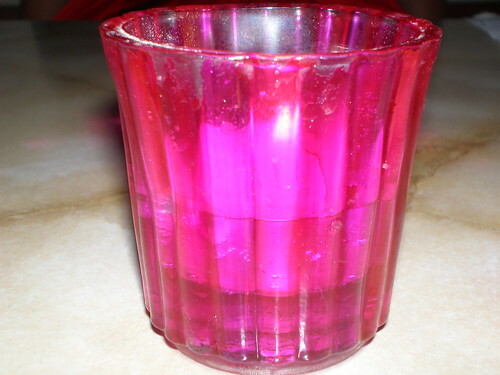 They had these very pretty pink glass candle holders on each table. I so want some! And the tap water came in these bottles with cute Pink Poodle labels on them. Heh! Yes, I am easily amused by things that are pink. Pink = bestest colour ever! And here it is - the main! 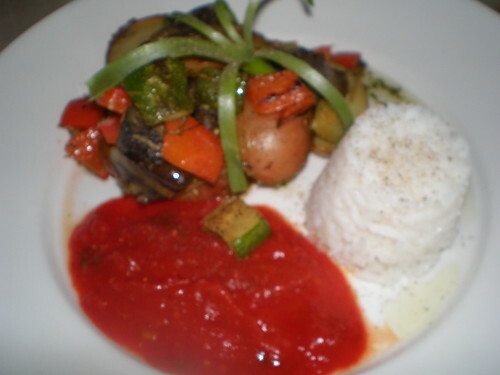 OK, it is essentially a vegetable stack, some rice and some tomato coulis. So not exactly high marks for originality. But look how cute it is! I have a SHALLOT FLOWER on my vegetable stack! And the rice is cute and shaped rather than just spooned on. I think it is just adorable! 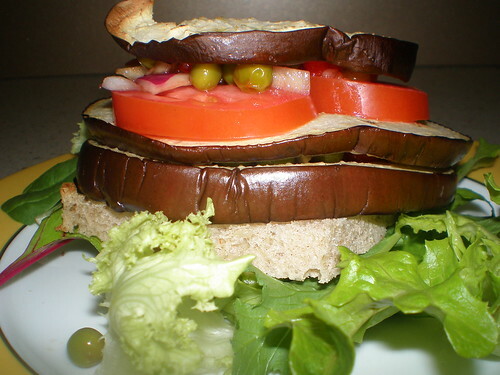 Anyway, as far as vegetable stacks go it was pretty good - actual flavour rather than just soggy vegetables! It had potato, zucchini and capsicum. OK, so ick to the last but I forgot to add the capsicum ban when I was talking to him. Hee! Cute! Sorry it is a bit fuzzy, the lighting was low and my camera is a bit lame. We got dressed up for the night! I was wearing my impulse buy new dress I got from Target earlier than week. I love Target for a good impulse buy! Dessert options for vegans at the restaurant were fairly non-existent. 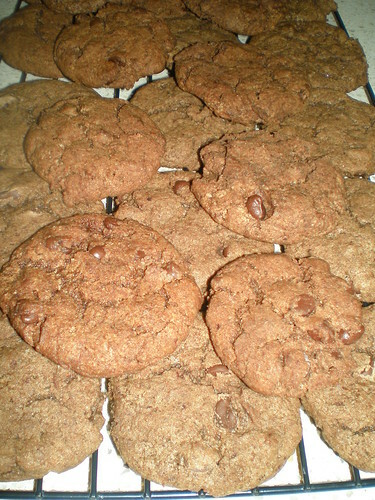 Which was fine, because the day before driving down I am made a huge batch of Chocolate Chip Mint Cookies from The Joy Of Vegan Baking. I love these cookies! We munched happily on them all weekend. Our last morning and first thoughts turn to breakfast! 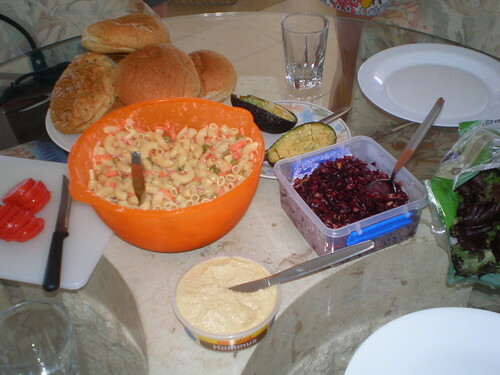 Bagels, spreads, avocado, salads... yum! 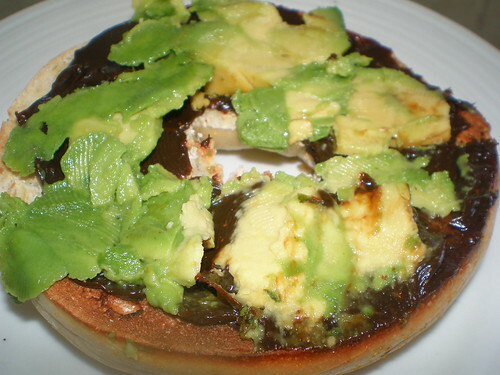 My favourite thing to have on a bagel or toast is Vegemite and avocado. An amazing combination! Then we headed out for a final walk along the beach! 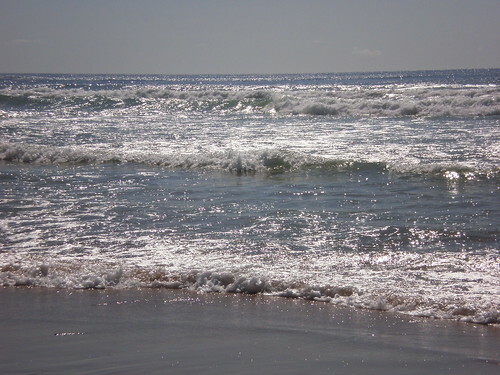 See, some pretty beach photos for you all! Then it was home and into the waiting arms of my beloved kitties, who I missed like crazy! All up it was a great weekend, just what I needed to get away from everything else! This is Possum and Sahara, on my bed, at the same time! Possum pretty much never comes on my bed. But my parents had been away for a couple of weeks on a cruise and one morning I woke up and found the kitten my hand was resting on was actually Possum! With Sahara right behind him. 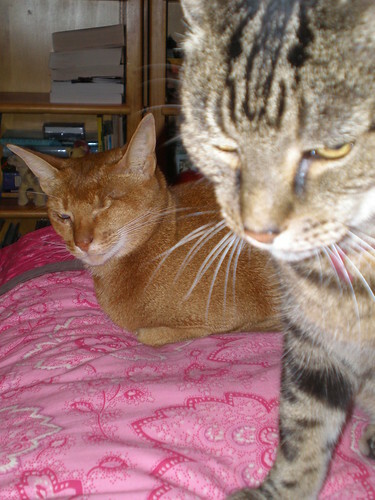 Thankfully my camera was miraculously at hand without me getting up and disturbing them. One time, I had all four cats on my bed at once, which made me deliriously happy! Currently stuck in my head: Currently I cannot get enough of the Dr. Horrible's Sing-A-Long Blog soundtrack. Joss Whedon is a genius! I am also still loving (Do You Wanna) Date My Avatar by Felicia Day, who is also in Dr. Horrible! Currently improving my mind with: Atonement. I hate bratty stupid kids. Argh! Only half way through, but I already know more or less what happens. What are you all watching/reading/listening to? AusNZVeganMoFo: Getting away from it all. Last weekend I was whisked away to the magical Gold Coast by two of my BFFs, known to you lot as The Jens, for a girl's weekend. We headed out of Brisbane on Friday afternoon, and the traffic was a bit slow in the peak hour exodus from the city but not too bad. Soon we had checked in to our appartment at Aquarius On The Beach at Surfers Paradise. We are girls who love to eat, so first on the agenda was dinner! We each made our own pizza. The Jen's are not vegan, so promptly set about cooking chicken and bemoaning the fact that no one had brought any cheese for the pizza. I had made a pizza topping ahead of time, so just heated it up and spread it over my pizza before baking. 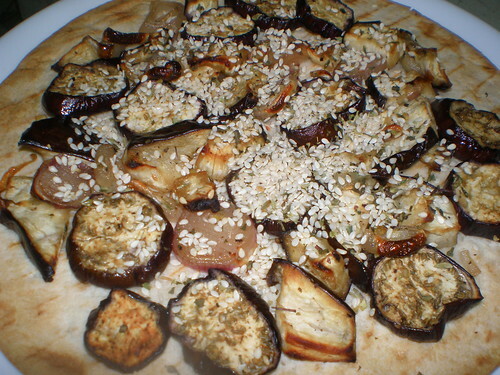 This is Roasted Eggplant and Sesame Pizza from Vegan Pizza. When I was doing the shopping, they were all out of frozen pizza bases, so this was one from the bread section. It was OK, but not quite as delicious as other bases. A bit biscuity. I totally ate my pizza like a big cookie, just picked it up and munched. The night progressed with some drinking, dancing and general silliness. I pretty much don't drink, but I did have a bit of Fresita Sparkling Wine, which is delicious because of the added strawberry pulp. So fantastic! Then we headed off for a pre-bed sauna and spa before heading off into the land of sleeping. 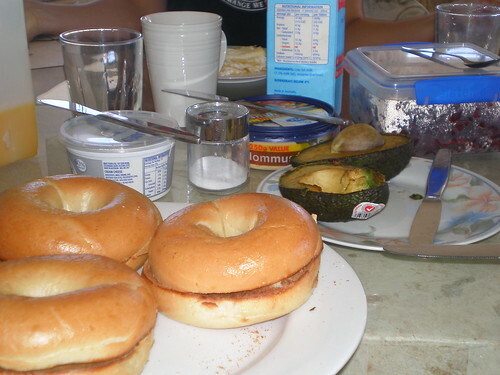 Our breakfast spread. 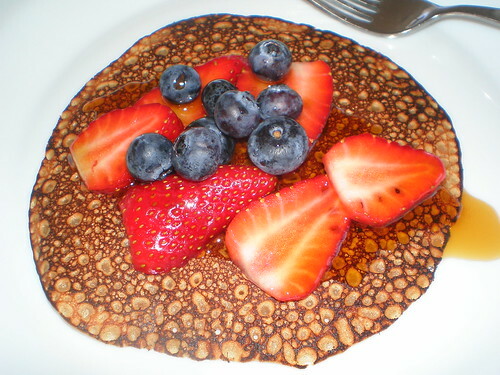 I had made a batch of batter the previous day to make Pancakes from Vegan With A Vengeance. The room only had a really crappy electric frying pan, which is why they turned out a bit dark. They kept on sticking! But they were delicious. 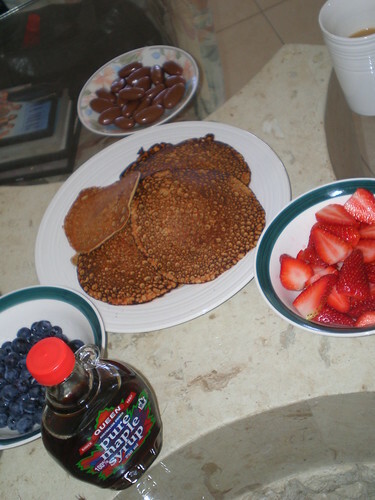 Here we have our breakfast spread - pancakes, strawberries, blueberries and maple syrup. And a bowl of Clinkers. That belongs to the Jens, not me. They seem to have a slight obession with them! The morning was spent on the beach. 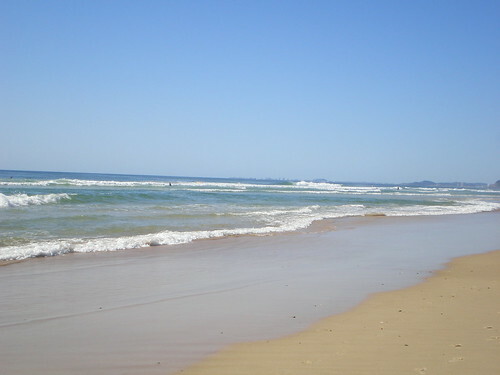 I applied many layers of thick sunscreen, layered up with clothes and headed down for a lovely 15 minutes on the sand. I then attempted to lead an inspired charge into the ocean, but the water was so cold that the three of us ran squealing out as soon as we were there! Despite our best attempts to coax ourselves back in, the thought of that cold water hitting our stomachs was just too great. So we settled for a swim in the pool instead. Or some of us did. Little Jen sat on the edge and would not come in, but Big Jen and I had a lovely time doing some synchronised swimming (I'm a flower!) and aqua-aerobics! Soon our bellies called to us again, so we headed up for lunch. Whenever Big Jen and I are at each other's houses, we love a lunch of fresh rolls with avocado, green leafies, tomatoes and hummus! 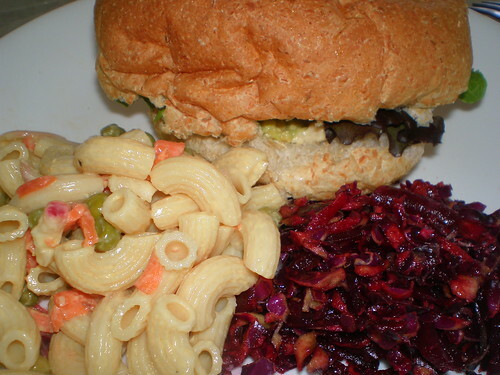 I had also made a batch of Brooklyn Deli Macaroni Salad from Veganomicon and brought down some left over Red Flannel Cole Slaw from Vegan Planet. Behold, a delicious lunch plate! Afterwards we decided we need to do a bit of shopping. 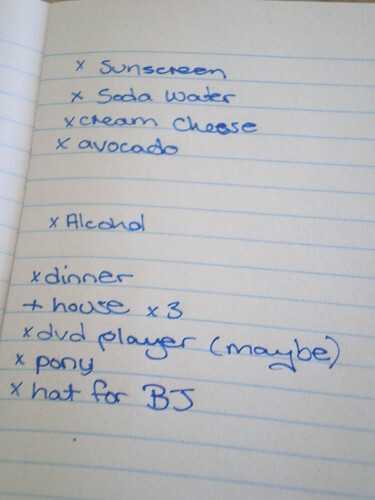 This is our list. Unfortunately, we did not come across any houses to buy for ourselves and the convenience store was fresh out of ponies for me! Hee. On the way back we stopped off at a potential place for dinner to see if they could do a vegan dinner for me. I spoke to the chef, who was adorably flummoxed but the idea of vegan and all the things he couldn't use (I did point out that there are far more vegan ingredients in the world). But he said by the time we came back tonight, he would have conjured something up for me! Which will be in my next post! I have a lot of photos to share, and it seemed all a bit too long to cram into one post. So stay tuned to see the incredibly cute dinner I was given! While I was a couple of weeks late posting about Father's Day, here I am several months late posting about Mother's Day, all the way back in May! By the stroke of luck, I actually had this weekend not being on call! So I had planned a super special secret weekend to celebrate. While Mother's Day is on Sunday, our weekend started on Saturday with a special day trip. We started out with a drive down the highway towards the Gold Coast. My mother is an academic, and her field is Japanese Language Studies. She's actually one of the world experts in this field, if I can have a little moment of awesome Mother pride! One of her friends and former colleagues has opened a little Japanese gallery in the midst of beautiful surroundings, complete with a tea house! 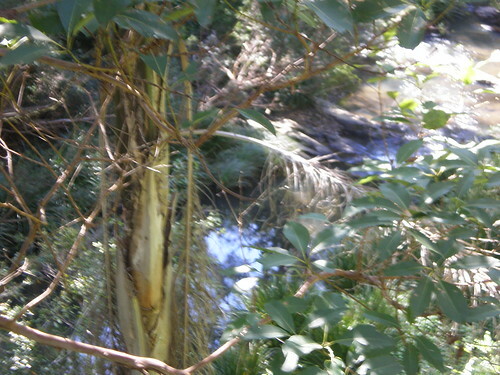 So our destination was Gallery Tokonoma in the gorgeous Gold Coast hinterland at Mudgeeraba. This was a great surprise for Mum, who hadn't been there for a few years but had often mentioned she was meaning to get down there again! First stop was morning tea in the cafe out on the balcony. A balcony surrounded by beautiful hills and even a gorgeous clear stream down below. I had called ahead to see if there were any vegan options for me, and was happy to find out there were some yummy sweets to put in my belly! 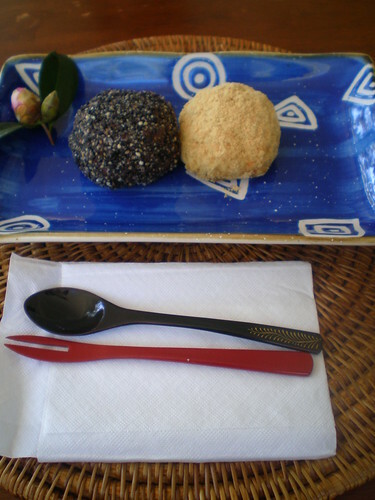 Ohagi - Delicious sweet rice balls! One was a red bean centre with rice around it and then sesame seeds, and the other was an inside out one with rice surrounded by red bean paste! 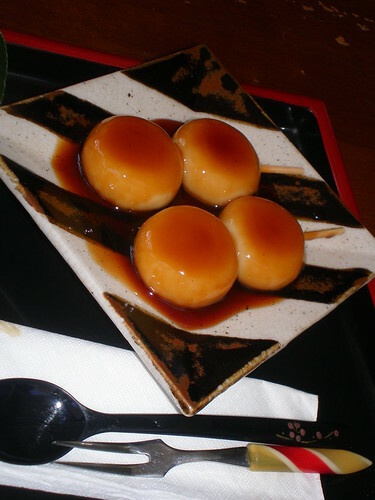 Dango - Glutinous rice and tofu balls on a stick and covered in an amazing sweet soy sauce. Nom! 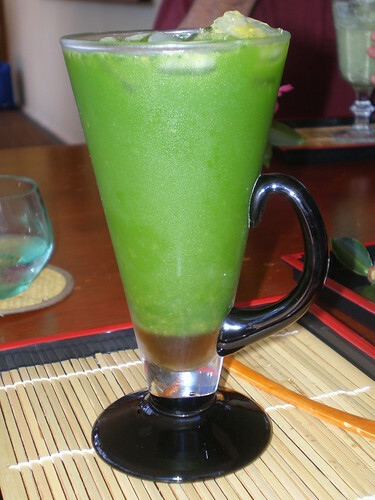 Iced Matcha Supreme - Delicious iced matcha with lemon myrtle. This was so yummy. You can see down the bottom there is some sweet syrup to mix in, but I almost like it better without the extra sugar hit! After morning tea, we had a wander through the gallery itself. And I bought this - how cute is it! Unfortunately I couldn't get a decent photo without a reflection in the glass. I am still waiting to have it hung in my room. The second I saw it, I knew it had to be mine! 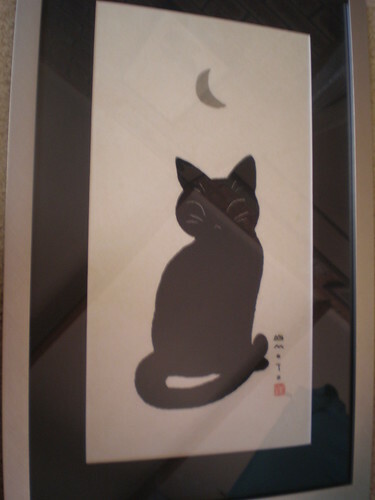 Mum also bought a screen print as well. After the gallery, we were going to have lunch at One World Love Cafe, only to find that it had closed down! Instead we drove down to Burleigh for lunch at The Magic Apple, a great vegan and vegetarian cafe. Sadly I forgot to take any photos! But I did have an amazing tofu burger and great juice. After lunch we headed on home to relax. I didn't remember what happened for dinner, but according to my mother and her diary she actually cooked dinner! 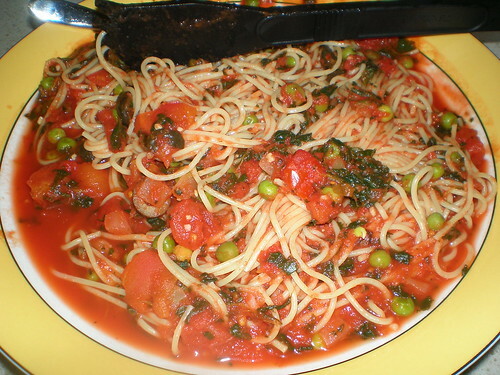 Some vermicelli with some tomato sauce and lots of vegetables. Easy, quick and tasty! After this, I convinced everyone that the best way to spend the night would be with a trip to see the Star Trek movie. Which is one of the best movies EVER! If you didn't see it in the cinemas, you missed out! I can't wait to get the DVD. So brilliant! The following day, Sunday, was the official Mother's Day. And I had decided to make brunch. 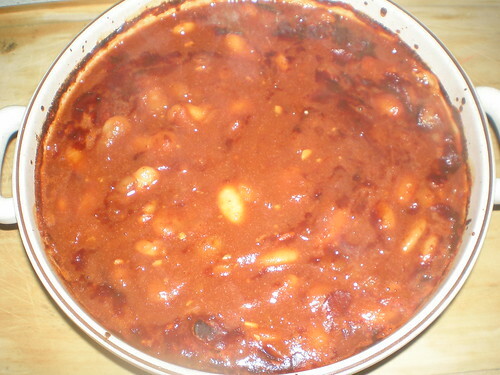 My mother loves baked beans, so I made some Brilliant Baked Beans from How It All Vegan. She loved them even more than the ones from Vcon! 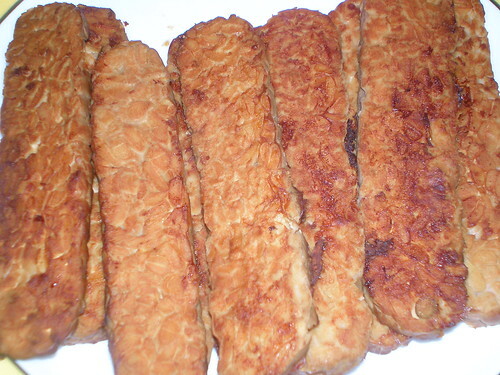 And what would brunch be without some Tempeh Bacon, this recipe was from Vegan Vittles. Yum! I think that tempeh bacon is far superior to the mock bacons, don't you? 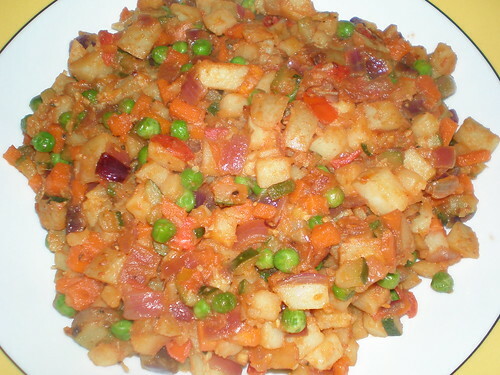 And finally a big bowl of Skillet Vegetable Hash from Vegan Planet - red onion, zucchini, potatoes and peas all fried up! The recipe also calls from capsicum, but as always I left it out. All up a nomtastic brunch! 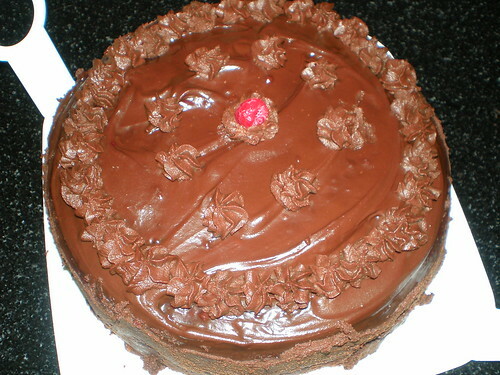 What followed was much lazing about until dinner time, when I made one of my mum's favourite things ever! 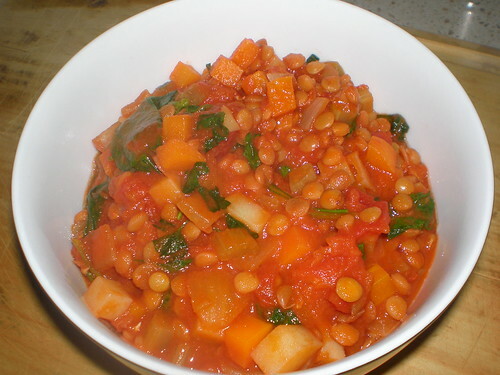 Aunt Bonnie's Lively Lentil Stew from How It All Vegan. This is a seriously great stew, it is full of flavour and is so great on a cold night! So there ends Mother's Day for 2009! 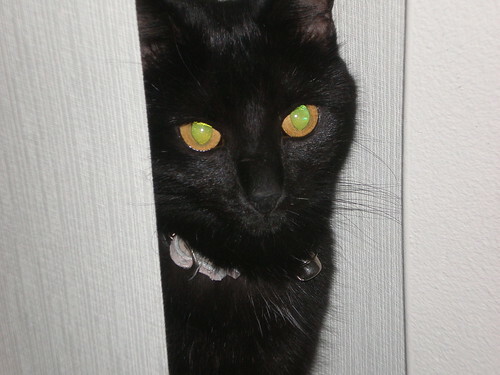 Oh yeah, it is my beautiful girl Gizmo! 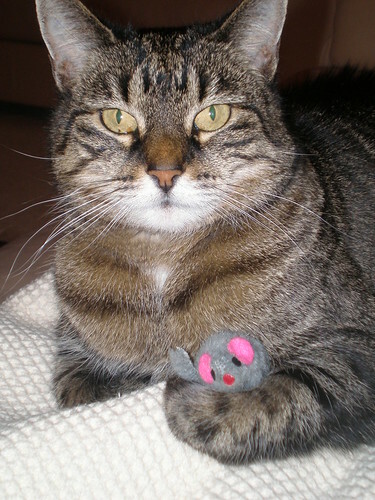 Looking adorable... with a toy mousie! 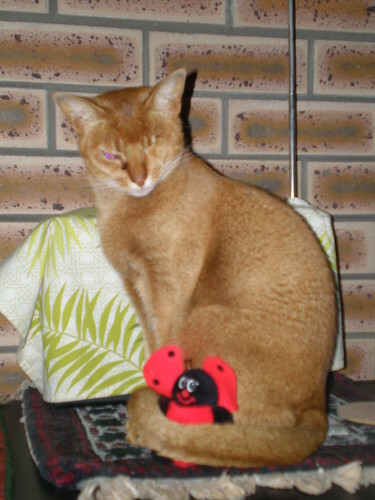 OK, I admit I may have placed the mouse there. Hee!